Now that daylight savings time has ended, you should double check your smoke alarms and fire alarms. Now that daylight savings time has ended, you should double check your smoke alarms and fire alarms. You’ve seen those announcement boards out on the highway, but did you listen to them? You might not think fire alarms are that important, or you’ve heard these myths and believed them. Either way, let’s find out the truth about these myths. This myth is incredibly pervasive. But it’s not true. The fire alarm will notify you of a fire, but they don’t work the same way as fire sprinkler systems do. 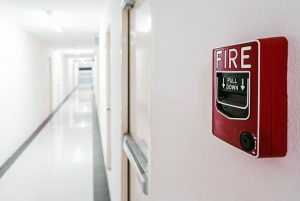 Fire alarms should be used in tandem with fire sprinkler systems and fire extinguishers. All three components are crucial to a successful fire prevention plan or protection program. Thus, it’s important to ensure all three are in proper working conditions, and employees know how to react in emergency situations. A fire alarm can’t stop the fire. All it can do is tell you that a fire is happening and that you should evacuate the building. As we mentioned above, fire alarms are just one piece of the puzzle. You should have other fire prevention and response protocols in place for dealing with any situations, such as a backdraft, that might occur along with an unexpected fire. This myth is untrue. One surefire way to make sure your fire alarms are fully functional is to conduct regular inspections. If you aren’t sure what you’re looking for during these sessions, call the professionals at Judd Fire Protection to take a look. You are required by law to have fire alarms installed and have them serviced whenever necessary. Compliance also demands that you meet the expected standards once repairs are completed. This last myth is perhaps even more untrue than the last one. Owners of commercial buildings or apartment complexes need to have fire alarms. These are also necessary for schools, hospitals, restaurants, theaters, and virtually anywhere else you can expect people to gather. Get your fire alarms updated, and if you don’t have any, it’s time to get them installed. This entry was posted on Friday, March 16th, 2018 at 3:26 pm. Both comments and pings are currently closed.